The impending battle for nGwakia Wells has seen some delay, in part due to the arrival of a troopship from sunny Girvan! The Regiment Guinalea was raised by the Emperor from Guinalean emigres. His intention was to aid (or incite depending on who is telling the story) rebellion in Guinalea itself although several complications, not the least of which is the Royale Navy, the Regiment has been employed elsewhere from time to time. In fact they are intended to sevrve in Guinalea in a series of actions intended to show Giggers' early career in the Dragoons, during the Rebellion of "The Nine That Ate", coming soon to a blog near you. The Regiment consists of two battalions. 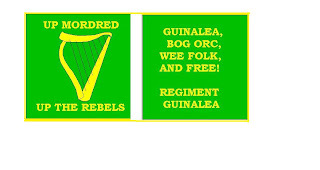 1st/Guinalea consists of 2 Elf Officers and 22 Bog Orc Other Ranks. The bulk of this battalion is formed by a 20 strong unit of Bog Orc infantry, painted by the talented painters at Alternative Armies. However, and as it turns out, fortunately, there was a mix up in my specification of uniform colour. As a result I painted the coat, collars, turn backs and cuffs meself and in doing so discovered a great deal of fine detail on these wonderful figures. They have obviously been living the field for sometime as their coats bear multiple tears and patches. Brilliant! I also took the liberty of adding a certain rosiness to noses and cheeks as befits their character. The uniform is based on that of the Regiment Irlandaise raised by Napoleon in 1803 as a light regiment. The Colour Party consists of three Bog Orc Grenadiers and their Elf Officer that I already had albeit in completely different uniform colours. So more quick painting and hey presto! The flag was fashioned from the Blazon heraldry program and finished with MS Paint. Which nicely leads us to 2/Guinalea, the Wee Folk. This battalion numbers one Elf Officer and 24 Wee Folk Other Ranks. Now in the established fantasy world of Valon, the setting of Flintloque and Slaughterloo, Halflings are said to exist only in Afri. Not content with such limitations I developed the "Pan Wee Folk Theory" which asserts that before the Big Folk races conquered all before them the world was habited only by Halflings and Goblins. To date I have identified two Halfling populations in addition to that of Afri. The Gorgon Halflings, the main source of the Otttermen Empires Mamelukes, and the Wee Folk of Guinalea. More of this endlessly fascinating scientific debate will appear in future posts : ) For now suffice it to say that there are Wee Follk and they have flocked to the Emperor's banner for a crack at hated Albion. The figures are Alternative Armies' HEVC Halfling troops painted to a colour scheme of my specification. These chaps came out so very well that I simply painted the very top of their hats a bit brighter to make them "pop" and added the same rosy glow to their noses and cheeks. The second battalion's colour party consists of three Halflings and their Elf officer. Only the first battalion received an eagle and the second has to make due with home made fanions. While first battalion is dressed and equipped the same as any Ferach regiment, the second battalion has been allowed to retain their native costume. Also due to the Wee Folk's inability to tolerate iron, they remain armed with their native silver and gold weaponry. While one might rightly think that such riches would leave them prey to marauding, it is best to remember the Wee Folk's capacity for mayhem is near unlimited. They retain their weapons in the face of marauding simply because they can! Here are some additional photos of the regiment. Hope you enjoyed the photos and thanks for stopping by! Not so sunny Girvan my friend. More than an inch of rain last night! The figures are looking great and I think the flag is spot on too. Just keep the Halflings away from the liqueur and they will be fine. Here is to a fine campaign season this summer! Fantastic - using the Halflings was a piece of genius. Tank you, tank you me bhoyohs! New Single from Professor Elemental! I am the very model of a modern monkey general. Copyright Bob Minadeo. Watermark theme. Powered by Blogger.